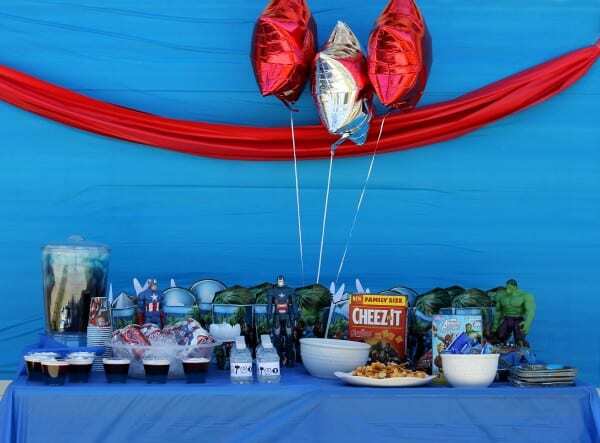 Games, snacks, toys and decorations and everything else you need to throw an amazing Avenger’s party! Have I mentioned lately how fun it is to be a mom of boys? It totally gives me a valid excuse to get excited about things like super heroes. 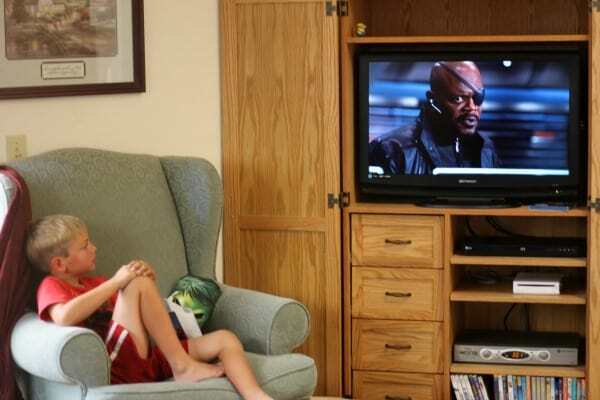 We are fans of the whole MARVEL series. (Iron Man 1, 2, & 3; Captain America 1 & 2, Thor 1 & 2, The Incredible Hulk, and The Avengers.) My favorite movie is probably Captain America, but there’s something cool about a movie that stars all sorts of heroes like the Avengers. 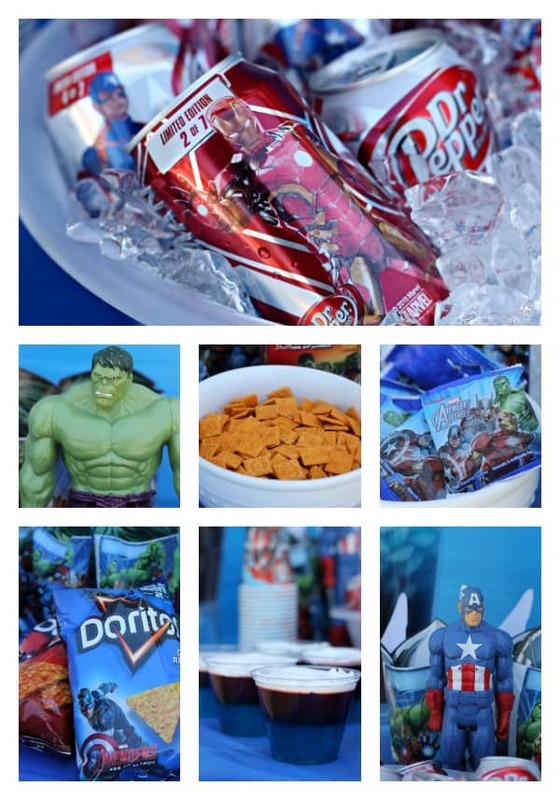 In anticipation of the upcoming release of MARVEL’s The Avengers: Age of Ultron on May 1, we hosted a SUPER fun (see what I did there) Avengers themed party. I scoured Pinterest and brainstormed with my husband for great party ideas and I think we put together an epic event! Shall we start with the food? That’s usually the most important thing at a party-at least in my opinion. 🙂 I knew we were going to be so busy running all the games for the party, so I needed simple party food that didn’t require a lot of attention. I put just a few things together ahead of time and then relied heavily on all the Avengers themed food at Wal-Mart right now. I got Avengers Cheez-its, fruit snacks and bags of Doritos. I didn’t take them out of the packaging, since it went right along with the theme! I also got some Dr. Pepper and Diet Dr. Pepper because they have these cool collectible cans right now! We had Iron Man and Captain America cans. I made blue and red Jell-o cups and topped them with whipped topping. That was my nod to Captain America on the food table. All you need to do is make one flavor of Jell-o according to the package directions and let it set up in the refrigerator for a couple of hours. Then make the next layer and pour it right on top of the first one. Top with whipped topping and you’re good to go! This does take a few hours, so be sure to make it the day before! 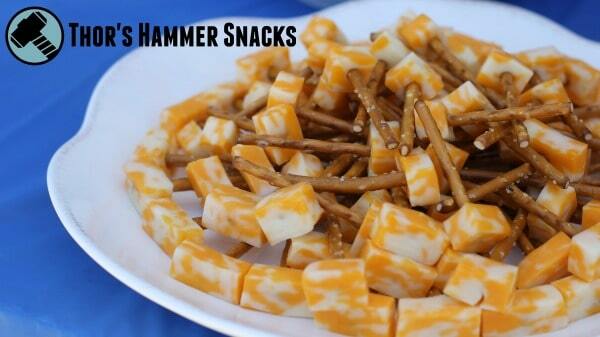 I also “made” these pretzel snacks using pretzel sticks and cubes of Colby Jack cheese. I cheated and bought cheese sticks so they were really easy to cut into cubes and stick on the pretzels. 🙂 These were so popular! The plate was empty within in minutes. They only mildly resemble Mjölnir (Thor’s hammer) but you get the idea. As another drink, I made a simple layered punch using cranberry juice on the bottom and blue Hawaiian punch on the top. It’s hard to see the individual layers in the photo because of the glare from the dispenser. But you can layer any drink and keep the colors separate if you use a higher sugar content drink on the bottom. Add the higher sugar content layer first, then put in a large amount of ice to keep the second “layer” from mixing with the first one as you pour. 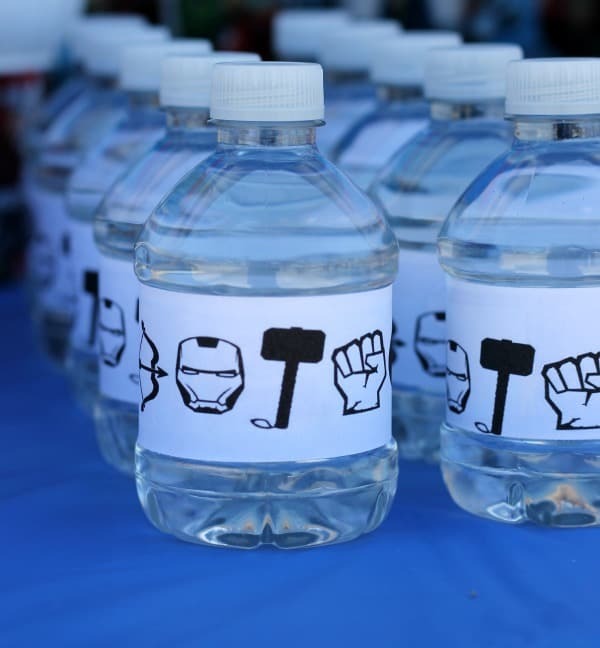 I also made some simple little labels for water bottles. I printed them in black and white and got 5 on a page. The labels are 1 1/2″ tall and 11″ wide (the width of my printer paper.) They overlapped just a bit on the back and that’s where I taped them closed. There was no need for packing tape or anything to make them waterproof since they were not in ice. I just chilled the water in the refrigerator and then set them out on the table. Planning the games for this party was by far my favorite thing I’ve done for the blog in a long time. 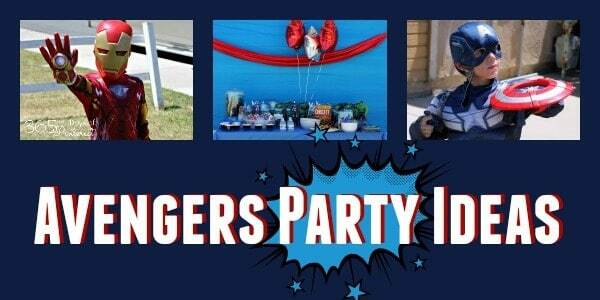 My husband came up with the idea of doing a carnival-style party with a “booth” for each Avenger. The winner of each game got to take home a prize, too! One of my favorite games was the Hulk Smash. 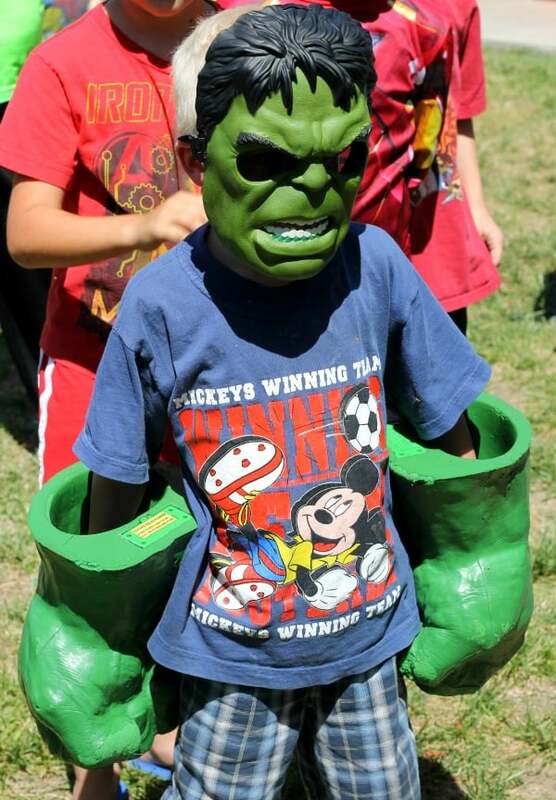 We set up a bunch of mini ice cream cones and the kids had to put on the Hulk gloves and mask and smash as many cones as they could in 5 seconds. We would count any cones that weren’t destroyed and the one with the fewest left was the winner! For the table, we used a large sturdy box and wrapped it with a green plastic tablecloth. A regular folding table was going to be too high for some of the kids to be able to really smash down the cones. The benefit of having this party outside was not worrying about the mess! 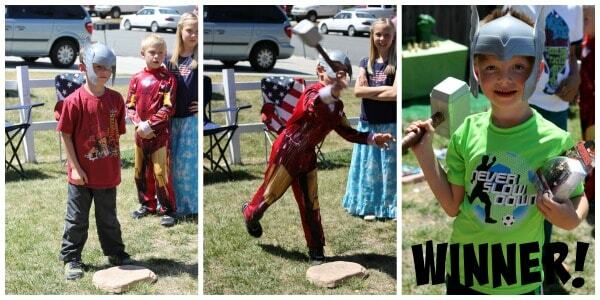 The next game was Thor’s Hammer Throw. I used empty K-cups and set them up on a folding table against the wall of the house. 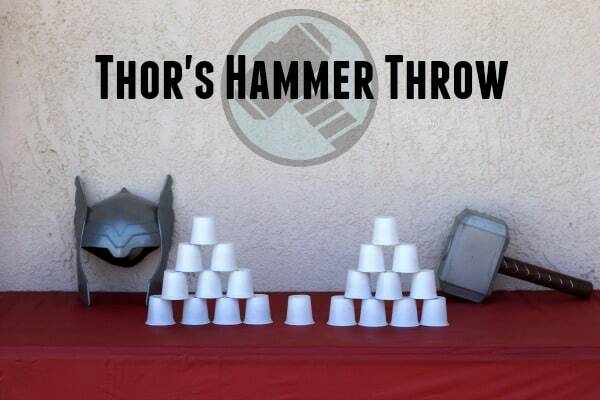 To win, you had to knock the most cups OFF the table (since knocking them down was pretty easy as long as you could hit the general area.) Having this up against the wall was good for containing the cups every time they were knocked over. It also helps to have someone help gather them and set them back up quickly for the next one in line! 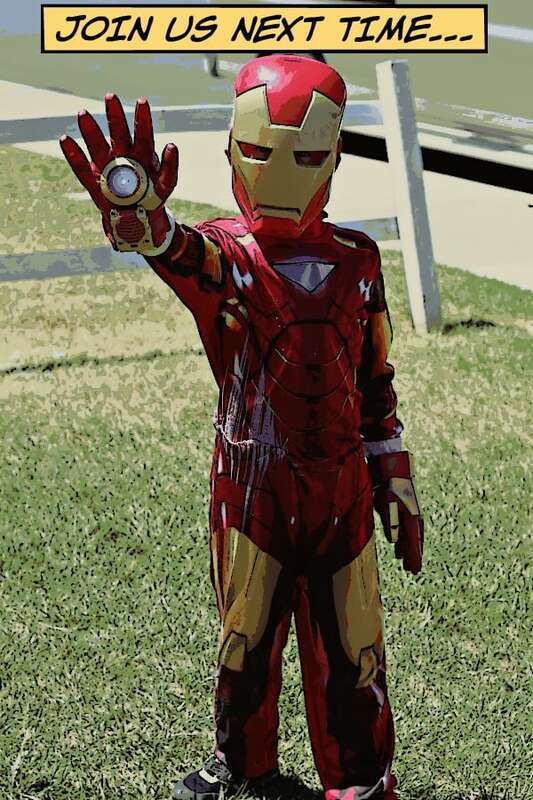 For our Iron Man game we used a simple corn hole board that I wrapped with a door cover I found in the party supply section at Wal-Mart. The kids had to put on the Iron Man mask and these cool new gloves that make noise and light up when you wave your hand around. Then they “shot” bean bags out of their hands and tried to make it in the hole. We actually had to have two rounds of this game because three players got one of their bags in the hole in the first round. They played a second round and although no one made it in that time, the one that was closest to the hole was the winner. 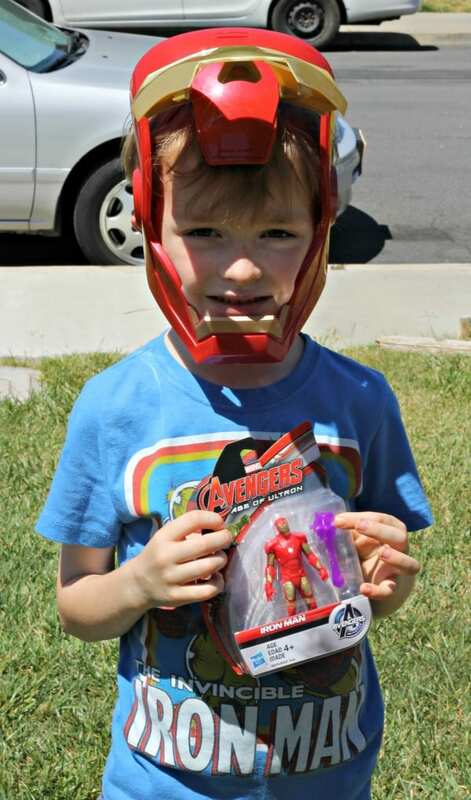 He took home an Iron Man action figure as his prize. One of the hardest games was for the lesser known member of the Avengers: Hawkeye. Maybe he’s not as popular because he hasn’t had his own movie made yet, but he’s pretty good with a bow and arrow! 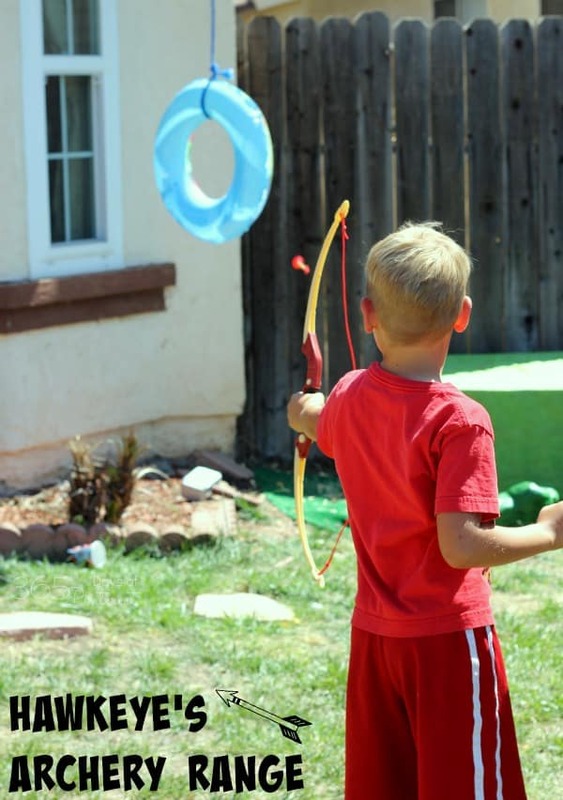 We used a toy bow and arrow set and the kids took turns trying to shoot the arrows through the hole in an inflatable pool ring. I gave the winner of this game a really nice Avengers beach towel. 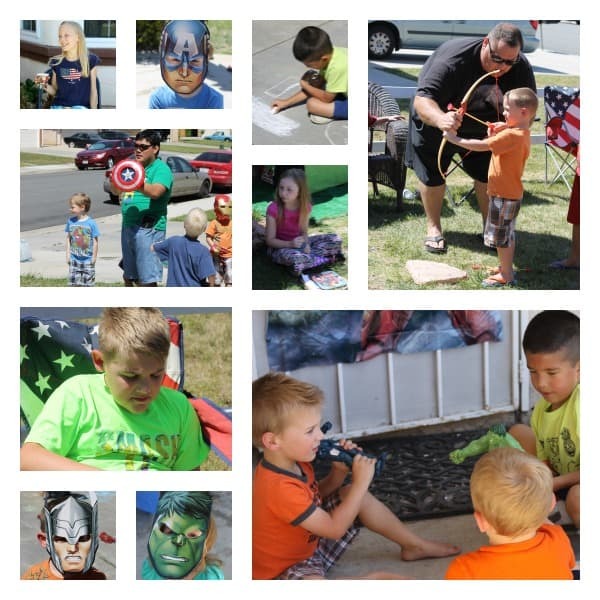 From a very unofficial poll of our party attendees (we had 33 people on our front lawn and in and out of the living room) Captain America came out as the crowd favorite. I got the coolest Captain America shield that shoots discs when you pull a string that’s attached to it. They fly REALLY far, so make sure you’re watching the street. We had a hard time keeping them in the yard. 🙂 The winner was the one whose disc traveled the farthest, but I honestly think this little guy wins the day! This party reminded me that you can have a great time with friends and even invite more people than you might think your home can handle-as long as you keep most of the party outside. 🙂 Oh, and planning ahead and having an awesome husband who helps with EVERYTHING keeps things running smoothly! 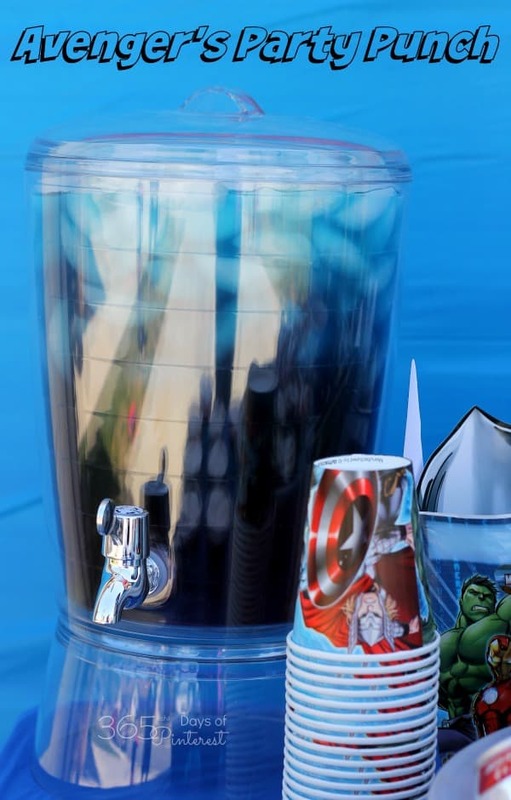 IHave you hosted an Avengers themed party before? I’d love to hear what you served for food or what games you played! Who is your favorite Avenger? I love this! 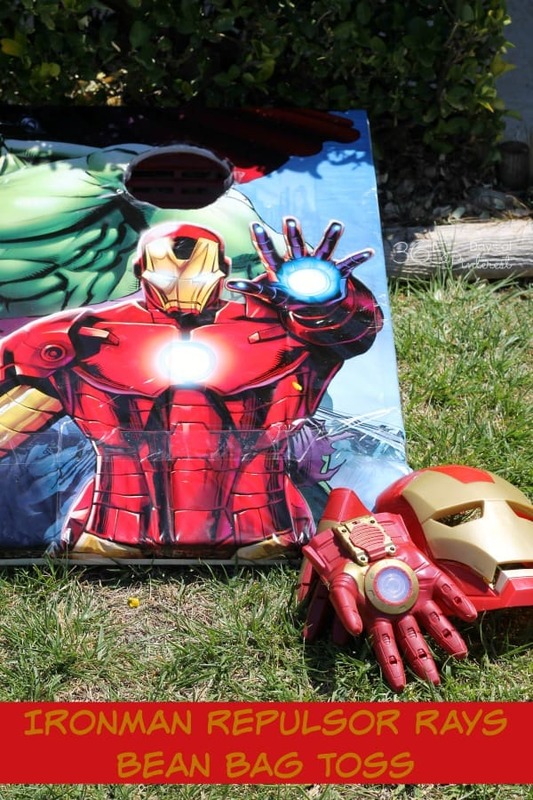 I really want to do the Iron Man Bean Bag Toss game. Where did you get that picture and how did you make it fit the game? I am so glad you all had so much fun! We are beyond thrilled for Age of Ultron, and we’re excited to go see it in theaters! Thanks for the great ideas–and I loved your bean bag toss! Nicole! This is sooo fun! What a great party, I’m sure your guests had a blast. 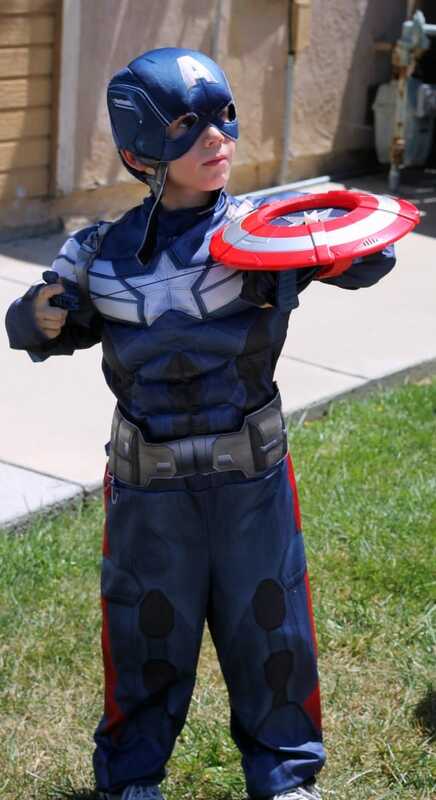 🙂 My boys would love something like this… we’ll have to have a superhero party once our backyard is finished. I’ll be back for ideas! Awesome job! What a fun party! 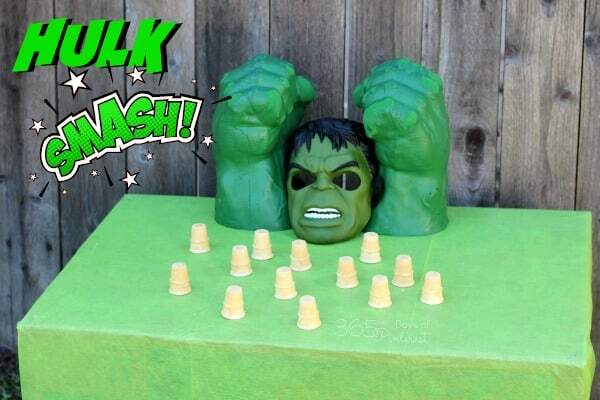 I love your party games, especially the Hulk Smash game. Kids will love that game. Thanks for sharing these ideas.